Delbridge Racing is offering shares to our owners and supporters in a very impressive Denman Indian Spice yearling filly. The filly is a very athletic and correct by the first season sire, DENMAM, out of the good producing mare, INDIAN SPICE. DENMAN is a Group 1 winning son of the mighty LONHRO. INDIAN SPICE has produced 7 foals to race to date and they have all been winners. The filly is a strong type and looks an early runner who will train on and develop as she gets older. She is eligible for the rich Inglis bonus race series as well as the lucrative SuperVOBIS Gold and BOBS incentive schemes. We worked closely with Damon Gabbedy, Belmont Bloodstock, to select this filly and Damon has had great success over many years including selecting SAMAREADY, the 2-y-old filly who won the 2012 Group 1 Blue Diamond Stakes, plus selecting Group 1 winners such as ENCOSTA DE LAGO, BEL MER, BENICO. Gary Sherer will train this filly at Tatura VIC. Gary has trained 52 winners for Delbridge Racing and is one of the best regionally based trainers in Victoria and has had many city winners for Delbridge Racing plus has won two Magic Millions races for us. From his base at Tatura, Gary has ready access to races in Victoria, NSW and SA and offers city training standards at country prices. The filly is already at the breakers at Eliza Park, Kerrie, VIC, as she may be an early type. 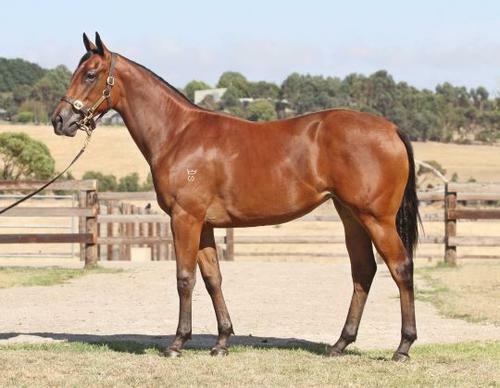 A 5% share in this filly is available for only $4515 which includes purchase price, buying fees, vet inspection x-rays, scope, Inglis series nomination, breaking in and transport and all costs up to 30 April 2013, GST and insurance up to January 2014. For further information please see our website http://delbridgeracing.com.au or email admin@delbridgeracing.com.au or phone Mark on 0419561715.